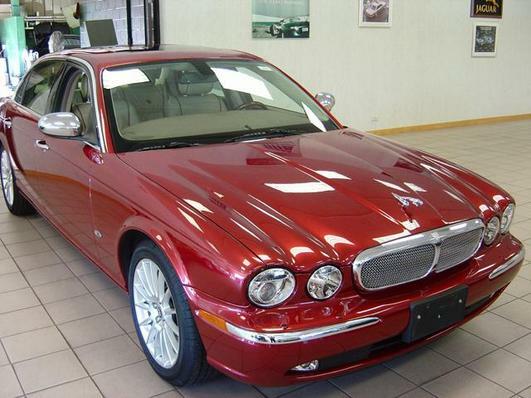 This is my wifes Jaguar XJ8L. We sold the XJR at 155k miles. It was a great car but she wanted someting larger and smoother. So we bought this 2007 XJ8L. This car gets great fuel economy. We got 31mpg driving it home from Chicago the day we bought it. This is our third Jaguar and all 3 have been red. We looked at several other colors but we really like this red. I did install a Motorola TK30 Bluetooth car kit in this car. The factory Bluetooth system only supports the hands free profile so it can't stream stereo (A2DP). The TK30 does moch more as well. You can stream Bluetooth stereo, use a USB drive for music and playlists, or connect a 3.5mm stereo jack to anything you want. Many options for listening to music. It also supports hands free much better because you can use the phones voice commands. Details of the TK30 install are here. We traded this car in at 123k miles, 9/2015. I had replaced the engine at 113k miles with a used engine that had 42k miles on it. We needed an all-wheel-drive car for winters. Jaguar started to offer the XJ in AWD starting in 2013 but those are still to new and prices have not come down enough yet.